If you’re sitting a lot, an ergonomic office chair is a smart and affordable investment in your health and wellness. There are hundreds of ergonomic office chair brands with many different features, so picking the right one can feel tricky. No worries, though, we’ve got you covered. 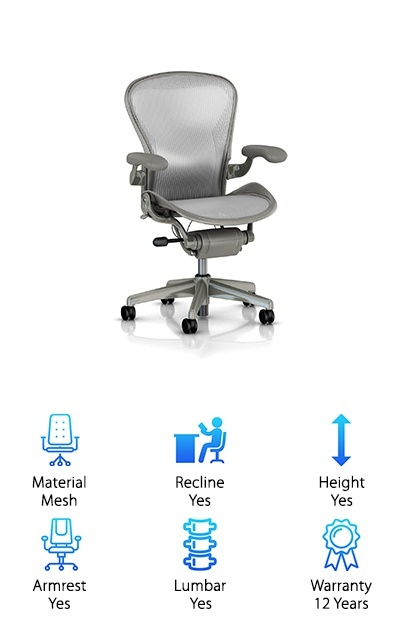 Here are the most important specs and features to look for when you buy your ergonomic chair. Material: The three most popular options here are breathable mesh, sturdy fabric, and comfortable leather. If you get hot easily, we recommend mesh. If you are looking for an impressive and comfortable chair, leather is an excellent choice. Fabric works great as well and many people like its resilience. Reclining: If you want to kick back and take a nap before that 10 AM team meeting, we get it. Most good ergonomic chairs support easy reclining, and some can even be locked in that position. A slightly reclined position is also considered very healthy for extended working, keeping your back, arms, and legs in optimal alignment. Height Adjustment: Height adjustment is a vitally important feature to look for. Everybody has a different height so it is crucial that you can adjust your chair for an optimal fit, especially if there are multiple users. Make sure to read the manufacturer’s instructions for an optimal ergonomic fitting. Adjustable Armrests: Adjustable armrests are not mandatory but a very nice feature to have. Being able to adjust the position of your armrests or detach them completely can help you to fine-tune ergonomic sitting. It is a matter of taste, but we certainly recommend adjustable armrests for optimal sitting. Lumbar Support: The part of the lower back where the spine curves is known as the lumbar area and this brave set of vertebrae takes on the majority of pressure when we sit. Great lumbar support makes for healthier and more comfortable sitting. It is an important feature and worth spending money on. Warranty Length: Nothing lasts forever, but that does not mean you should not be able to get your money back or get free replacements if something goes wrong or isn’t to your liking. A good warranty is worth its weight in gold for an ergonomic office chair. Think movable parts and lots of wear. 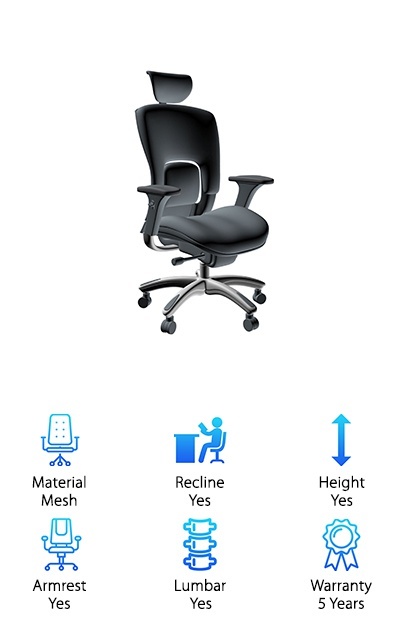 All right, we know you are busy so let’s get right to the ergonomic office chair reviews. After searching far and wide, we are happy to share the ten best ergonomic chairs for sale. All of them offer excellent sitting and health benefits, so simply pick the one that fits your taste and budget. In a hurry? Check out the Top Pick and Budget Pick! We all know that work isn’t always the most stimulating place to be, so wouldn’t it be great to have a chair that helped keep you focused, healthy, and alert? That’s exactly what the Embody from Herman Miller does. 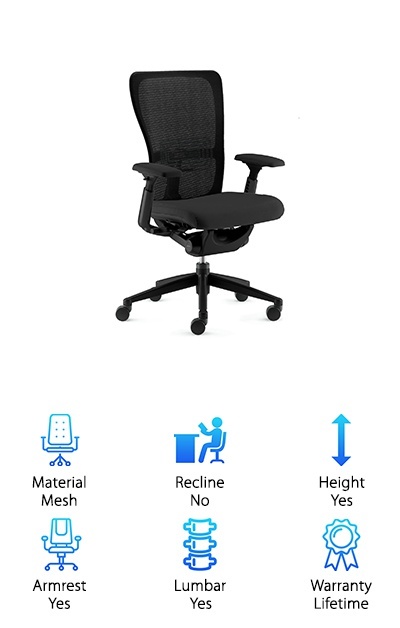 Ranked among the best chairs ever built, this premium ergonomic office chair is designed to reduce stress, support blood flow, and keep you alert at all times. The secret is the cutting-edge matrix of pixels in the back and seat that stimulate the flow of blood and oxygen to the brain while at the same time keeping your posture perfect. Sitting in this chair feels noticeably healthier the second you try it. In essence, the chair helps you to sit very ergonomically while allowing for small, natural movements that keep your body energized. The textile fabric conforms wonderfully to the contours of your back, and the adjustable seat depth allows even people with very short or very long legs to find a comfortable position. In short, it’s one of the very best chairs we’ve researched, and we highly recommend it. This chair has won every award out there and there’s a clear reason why. This is the gold standard of ergonomic sitting. It’s an excellent value, and the 12-year warranty shows the level of quality you get here. This sleek and stylish leather chair from Serta specializes in relieving mid-back strain from prolonged sitting. The contemporary look of this comfortable office chair is the result of a mix of modern design and science-based engineering. The best feature is the deep and comfortable pillows that create a relaxing seating experience, upright or leaned back. This chair is so relaxing that you might find it hard to stay awake! Your back will love it, fully awake or sleeping, that is for sure. Subjectively, we felt that this chair offers excellent sitting even after hours of work. Pneumatic lift and lockout features are controlled by seat-side levers, meaning you will have maximum convenience without having to shift positions. The eco-friendly leather chair tilts your pelvis slightly forward when you lean for an optimal seating position and back support. Both highly adjustable and customizable, this chair offers great value, comfort, and style to go along with the credibility of the Serta brand name. We highly recommend it. The Aeron Task Chair by Herman Miller is built for the sole purpose of perfect ergonomic sitting. In fact, it’s designed to actively relieve that sore feeling in your back and neck that you get from cheap chairs and wrong sitting. The patented mesh material helps distribute weight more evenly across your body, relieving the stress normally felt on the lower back and neck. It also helps to keep you cool and comfortable. The high-tech construction of the chair responds to your movements to keep your body properly aligned in all positions! 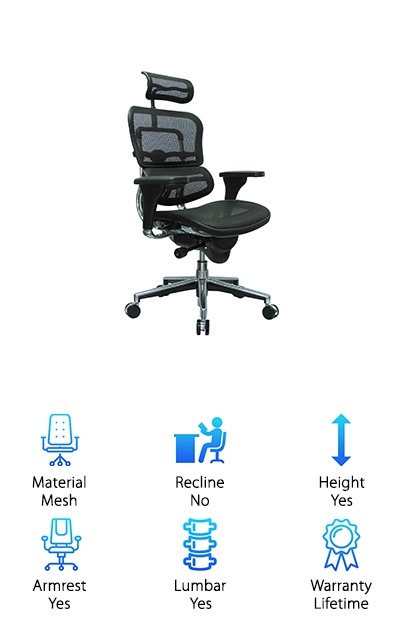 The chair’s excellent lumbar support and highly adjustable back, height, seat, and arms make it one of the very best ergonomic office chairs you can buy. You’ll be able to choose the position most comfortable for you and stick with it, sitting perfectly even after several hours. This chair offers excellent value and high-end ergonomic sitting. With an excellent 12-year warranty it’s a smart investment that you can use for many years to come. 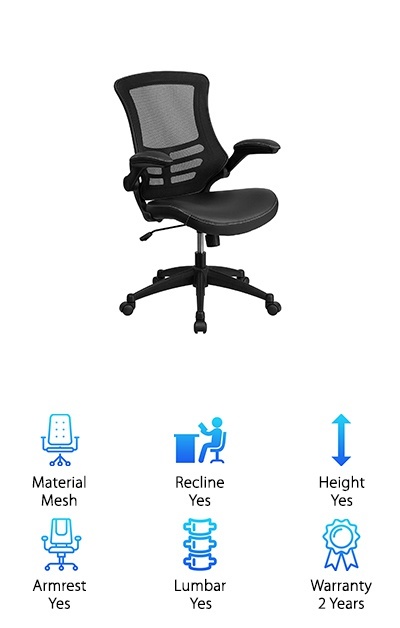 There are few other chairs that offer this level of quality. With the Zody Chair model, Haworth wanted to create a chair that’s simple but very ergonomic. This chair has easy-to-reach, labeled adjustments including a great three-point tilt mechanism, adjustable back, and forward tilt. Few other chairs offer this much fine-tuned adjustability mixed with ease of use. It’s built for power users and all people that sit a lot at home or work. The Zody’s lumbar adjustment technology is the result of years of scientific research, meaning that the support to your lower back is spot on. 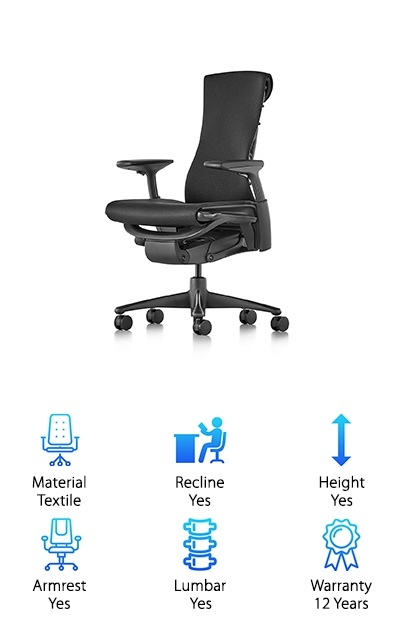 Another reason we fell in love with it is how flexible this comfortable office chair is. You can adjust a wide variety of settings in small increments, offering you that perfect position you’ve always looked for. 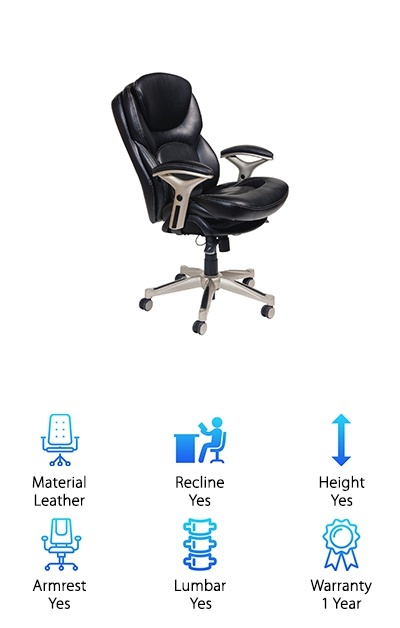 The chair is comfortable enough so you can sit your desk for long periods of time and stylish enough even for the CEO’s office. It’s also the only chair fully endorsed by the American Physical Therapy Association for science-based comfort. You get a lot of value here at a good price, and you’ll be able to use this chair for many years of healthier sitting. It’s a great choice. Inspired by the breakthrough engineering and immense carrying capacity of the Golden Gate Bridge, the SAYL chair from Herman Miller is a work of art as well as a fantastic sitting experience. Billed as “life unframed”, this chair is the result of sophisticated engineering, design, and ergonomics. The ArcSpan actively supports your back and provides maximum comfort for those sitting for long periods of time. You’ll notice the difference even after just one use. Your back, legs, and arms naturally settle into a healthy, ergonomic position and stay there without effort. Moreover, the Y-shaped tower provides extra support for your spine. Assembly takes no time at all and the controls are simple, so it’s great for those who want a great ergonomic chair that’s easy to use. The chair’s design will also help to improve your posture and provide maximum comfort, all while looking great doing so. It’s an excellent chair and comes at a very good price for the included technology and ergonomic science. Adjustable, breathable, comfortable, and high-value, the Elusion Series Swivel from Alera is a great buy for those of you looking for a comfortable seat with top-notch back support. The chair features a streamlined and very attractive design, plus smart ergonomic engineering to support your body. The contoured seat cushion’s waterfall edge is designed to take pressure off of your legs, so you can say goodbye to that unhealthy feeling when your legs fall asleep from constricted blood flow. We also liked that this chair combines the resilience of fabric and the breathability of mesh. The mesh back is designed to help keep you cool (even if you lose your cool at work), so if you often overheat or feel sweaty, this chair is a great fit for you. Plus, if you spend most of your day seated at a desk, then this chair will help relieve the common discomforts that you feel, including being too warm, legs that fall asleep, or that uncomfortable feeling of a pinched posture. It is a great package that offers fantastic sitting for busy people. They called this chair a dream and it is not an exaggeration. The GM Executive Chair is designed for maximum comfort all day. It is fully adjustable, meaning the back, height, and arms can all be set to suit your body perfectly. The extra tilt tension control is great for long work hours and the very breathable mesh back allows maximum air circulation for extra comfort. Sitting in this chair feels both supportive and comfortable at the same time, a delicate balance few chairs achieve. The chair is also 97 percent recyclable and green indoor air quality certified, so it is good to know that producing these protects the environment! The adjustability, extremely comfortable headrest, and mesh back allow for maximum relaxation all day long, and a very tailored seating experience. It is a smart choice for your back and the environment. The new Ergohuman from Eurotech is designed with mesh seating and back, which means it’s one of the most comfortable office chairs and also one of the most breathable options on the market. With eight ergonomic adjustments, you’ll be able to tailor your position down to the last detail. The tilt-tension control, back angle and height adjustments, and the variable seat depth make for fantastic support and great comfort all day. We recommend trying different settings until you find that sweet spot where your entire body feels comfortable and supported, it makes for great sitting! The arms adjust incredibly high, so if you’re very tall or simply have a long torso, you’ve literally found your fit. The well-designed, polished aluminum frame ensures durability and strength for frequent use. Last but not least, you get an incredible lifetime warranty which underscores the quality of the product you get here. This contemporary model was designed specifically for those who stay glued to their computers at work and home for long hours. We all do it, but that does not mean you need to sit poorly. 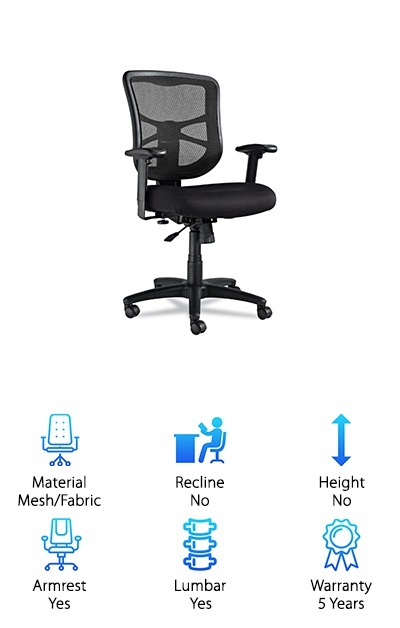 The mesh back not only helps with air circulation, but it also provides extra lumbar support for people not wanting to be hunched over when they immerse themselves in work. The swivel seat with waterfall design allows for great mobility if you need to switch between positions or devices, and the flip-up arms add extra convenience for people who hate typing with that unwanted elbow pressure. The pneumatic controls of the chair take all of the hassles out of height adjustment, too. All in all, the Task Chair is one of the best value grabs on this list and one of the best affordable ergonomic chairs you can get. The Balt Butterfly Ergonomic chair is one of the most well-designed and comfortable office chairs we have seen. Fully made of mesh to keep you cool and focused no matter what the temperature, and capable of tilt rocking into three different positions, it is great if you need maximum flexibility and comfort. The synchro-tilt mechanism allows for easy seat adjustment to add extra support to the already comfortable lumbar support of the back. The flexibility of the armrests and headrests means you can find that sweet spot no matter which time of day it is. 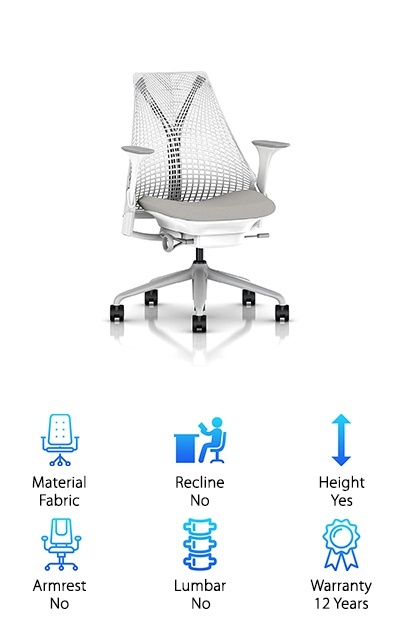 The impressive array of ergonomic features makes this a great ergonomic chair for anybody. We liked the design, ergonomic sitting benefits, and the price tag. It is an unpretentious and overall great chair.